Loggers have been falling trees from Eatonville to Rainier for generations. 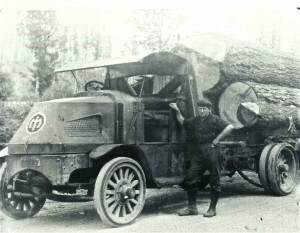 This 1926 Mack Truck, must have been quite the rig in it’s time. The tires are a far cry from today’s commercial truck tires. Here’s a fun video of an old Mack — not as old as the photo though — hauling wood. I don’t know who this truck belonged to. If you have any information on this photo, please share. Photo courtesy of Gary & Debbie Saint. Great truck, great shot, but the grille design on the hood sides and the radiator (behind the hood on these AC models) mark it as no newer than an early 1917.